The Conner Museum of Natural History this fall presented Nature Twice, an exhibit that brought together poems that use themes and imagery of animals with animal specimens on display in the museum. The exhibit encouraged visitors to consider how our impressions of the natural world are shaped by both science and the arts. The exhibit was curated by faculty and students in the Department of English and the School of Biological Sciences. 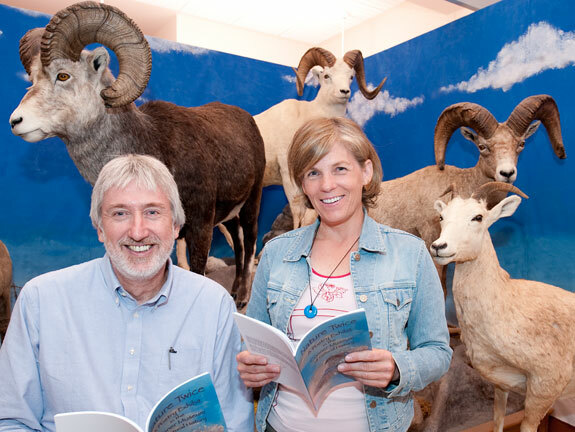 A guidebook to Nature Twice can be downloaded from the Museum’s website. I lean on a glass case that displays stuffed egrets, herons, and sparrows. Across the room, Larry Hufford—director of the Conner Museum of Natural History and professor in the School of Biological Sciences— taps data into his computer. Larry is tall with thick graying hair and sharp blue eyes. I’m a full foot shorter, and this, coupled with the fact that I’m a professor in the English Department, makes for an unusual collaboration. For that tidbit of science, I trade poetry, launching into a line from Samuel Taylor Coleridge’s “Rime of the Ancient Mariner,” a poem I teach about a seaman who kills an albatross in the Antarctic Ocean. Larry’s eyes sparkle, which means collaborative ideas are brewing. I’ve seen this gleam before when the two of us taught a graduate course on the history of scientific travel. We took students backpacking to teach them about the poetry and plant life of the Inland Northwest. Sadly, our collaboration is a rare one, even today, more than 50 years after physicist and novelist C.P. Snow gave his now famous Rede Lecture at Cambridge University, denouncing the gaping chasm between scientists and literary intellectuals in the twentieth century, which he called the “two cultures” problem. Snow implied that many scientists couldn’t make it through a Shakespeare play while humanists didn’t know the theory of relativity. This separation was more tragic in light of the fact that science and literature have similar intellectual roots and, at one time, shared not just methods but modes of expression. Some sixty years before Charles Darwin published his paradigm-changing Origin of the Species (1859), his grandfather Erasmus had already pointed out that organisms changed throughout successive generations. But he did it all in rhyming poetic verse in a massive book called The Loves of Plants. 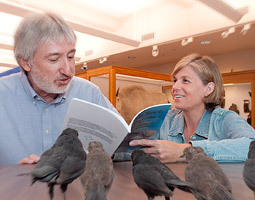 Over the next few months, Larry and I and a group of graduate students and colleagues from both disciplines collect animal poetry and match it to the specimens in the Conner Museum. The matched poems and specimens become the exhibit Nature Twice. It’s one of those magical moments when the combined efforts of science and literature illuminate the diversity and complexity of our world.